The Tube ‘n Train Adventure departs from the Heber Valley Railroad Depot, travels to the Soldier Hollow Platform, then returns to the Heber Valley Railroad Depot after an exciting, tow lift-served snow tubing session. Get out and experience winter fun combining a train ride and snow tubing on a 1,000 foot groomed hill with tow lift service.Enjoy approx. 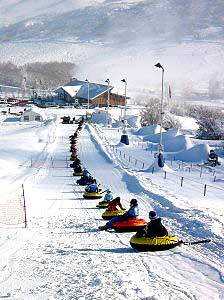 90 minutes of snow tubing before returning on a relaxing train ride to Heber. Note: the 3:00 pm departure returns by bus. Fare includes train ride, snow tube, tow lift pass, shuttle transfer. Food options limited at tubing hill. Order boxed lunch with advance reservation.